The painter Adolf Dietrich of the Thurgau created in the year 1935 this picture. 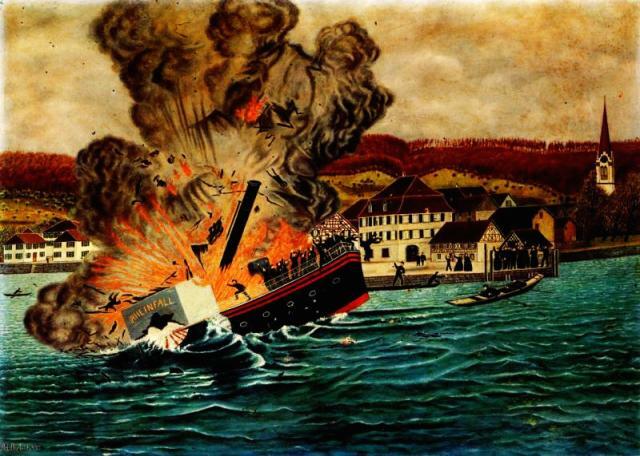 It shows the sinking of the "Rheinfall". The steam boat "Rheinfall" which had been built in 1865, perished in the year 1869 near Berlingen. The reason was an explosion of the vessel. Seven people and some kettle died during that accident. The painter Adolf Dietrich of the Thurgau painted in the year 1935 this picture from the sinking of the "Rheinfall". The steam boat "Rheinfall", which was built in 1865, perished in the year 1869 near Berlingen because of an explosion of the vessel. Seven people and some kettle died during that accident.